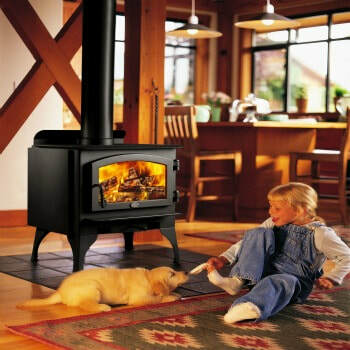 This Lopi Wood Stove for Sale | 1250 Wood Stove is big on heat small on the pocket book. The 1250 is a quality, entry level stove that performs. The affordable, 1250 is great for heating rooms, offices or even smaller sized homes. Relax and enjoy eight hours of heat without needing to reload the stove. This durable steel constructed unit sports a convection surface for optimal heat output. This powerful unit can heat up to 1,200 sq. ft. The 1250 also features a large cooktop surface, great for preparing hot cocoa or tasty dishes.